A vehicle wrap is the application of a high performance, eye-catching, digitally printed vinyl that adheres to your vehicle’s painted surface. There are several factors to the cost of a Vehicle Wrap: Design Time, Materials, Printing, and Installation. The size of the vehicle, the amount of the vehicle to be wrapped and type of vehicle all contribute to the total cost. Vehicle Wraps come in several different types that mainly depend on coverage and size.Some examples include Partial Wraps, Half Wraps, and Full Wraps. No, in fact, the paint under the Vehicle Wrap is protected from the UV rays of the sun, exposure to the elements, and minor scratches. A wrap will not affect the resale value of your vehicle. What materials are Vehicle Wraps made from? Vehicle Wraps are made from a high-performance weather-resistant vinyl that will stand up to years of weather and the elements. Vehicle Wraps are installed by a professional who uses heat and specialized tools. The installation is usually completed within a few days, depending on the size of the vehicle and detail of the wrap. We give our customers a time frame of completion prior to starting the wrap installation. How do you remove a Vehicle Wrap? We recommend that a professional remove the Vehicle Wrap within the lifespan of the product which is typically 3-5 years. When removed by a professional, there will be no leftover adhesive residue and your car will be as clean as the day it was originally wrapped. On an average permanent application the Vehicle Wrap graphics will last up to 5 years, with the window areas lasting about 2 years. Can you wash a Vehicle Wrap? Yes, you can hand wash your Vehicle Wrap, but we recommend that you DO NOT pressure wash your vehicle as this will certainly damage the Vehicle Wrap. Can a Vehicle Wrap be repaired? Depending on the severity of the damage, small areas can be repaired easily or larger areas may have to be totally replaced. Yes, please see our Warranty Information page for more information regarding coverage. 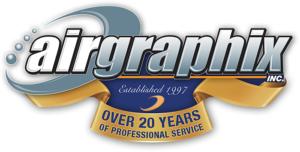 Any questions about vehicle wraps that aren’t in the list above can of course be answered by giving the experts at Airgraphix a phone call! Thanks for sharing this post. Keep em comming.